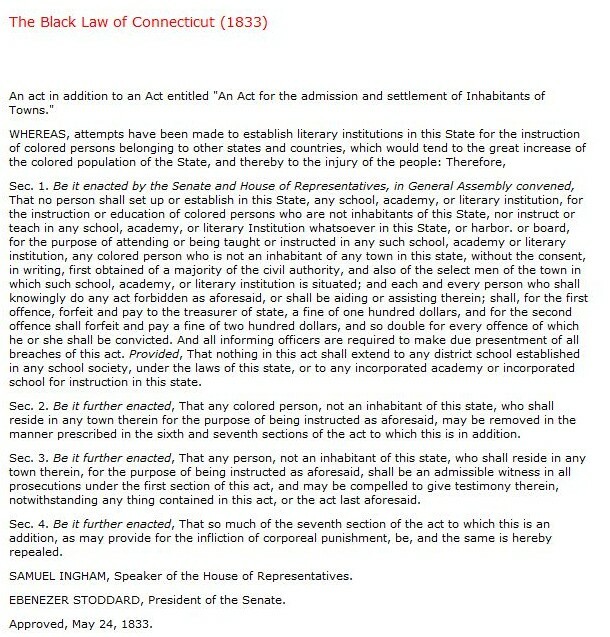 What later became known as the “Black Law” was enacted to prevent “the instruction of colored persons belonging to other states and countries, which would tend to the great increase of the colored population of the State, and thereby to the injury of the people.” This law was in response to Prudence Crandall’s establishment of a school to educate African American girls in Canterbury, Connecticut. What was the Black Law? How did it affect Prudence Crandall’s school? What did Prudence Crandall do to break this law? Was it possible for Prudence Crandall to fight this law? Why or why not? “The Black Law of Connecticut (1833).” Citizens ALL: Africans Americans in Connecticut – The Gilder Lehrman Center for the Study of Slavery, Resistance, & Abolition, Yale University. What does “inequality” mean to you? How may people be treated unequally? What would you have done if you were Prudence Crandall in 1833? How would you have handled the injustices? How would you go about letting others know about unfair laws? Brainstorm things happening in your community that you consider wrong, unjust, unfair, or unkind. Decide as a class to take on one of those injustices and find appropriate solutions. Research the education of girls in other parts of the world. Are girls receiving an equal education to boys? Is this a result of local laws? Investigate newspapers from the time period. Here is a digitized collection of newspapers from 1830-1860s held in the collections of the Connecticut State Library. ConnecticutHistory.org: “Prudence Crandall Fights for Equal Access to Education” by Diana Moraco.